So another day’s plod in front of me – left Melvich and got my head down and started walking along the road till I climbed up the hill to look down on the village of Strathy. (see photo). 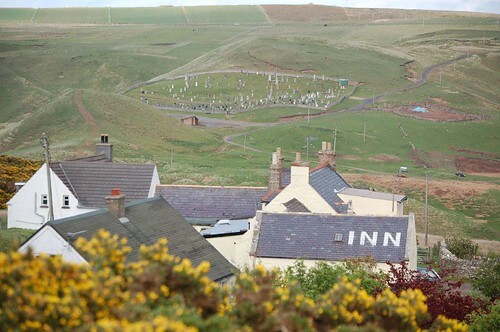 I noticed that the Inn had a sign saying “sorry no room at the Inn” which I thought was quite amusing. After I had cleaned myself up and dried my trousers, I headed north to Strathy Point to see what all the fuss was all about. I got there, looked at the lighthouse and then turned back. It was incredibily windy there which I put down in some way to the Highland Clearances. 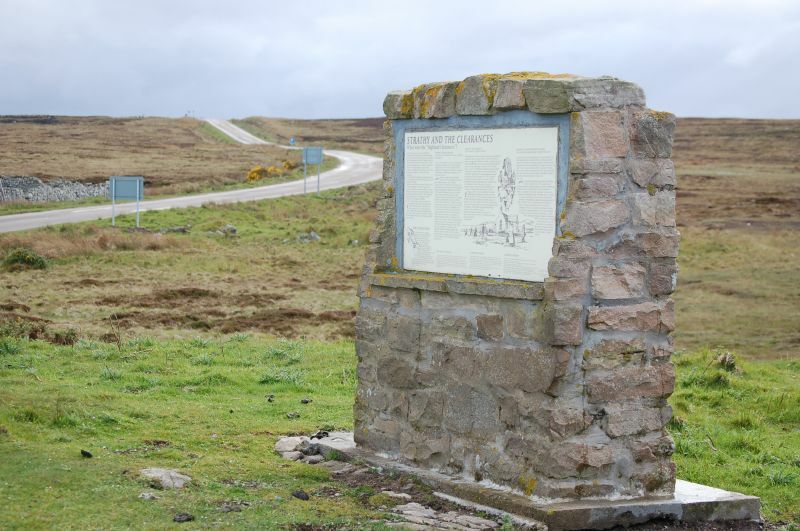 There is now a massive industry in these parts whereby most of the crofters are employed by the government making signs explaining the history behind the highland clearances; many crofters work maintaining the highland clearance villages for the tourists to gawp at and be edumacated about. Whenever Im faced with a big monotonous hill to climb, or a long stretch of featureless road I play games in my head to stop (or at least postpone temporarily) the feelings of panic, despair and self examination; the latter should be avoided at all cost. (Can you see what I did there? I put the last bit in italics and bolded it, to convey its sense of importance). Anyway, one of those games is to look at my watch and then try and guess how long a certain predetermined length of time has gone by. Then I’ll look at my watch again and see how accurate I was. When I first started this game, the concept was good, but it needed to be fine-tuned – I think thats because I started trying to guess when 45 seconds was over. Later I realised that there were lots of 45 second chunks in a day and now I play with intervals of approximately one hour. The astute among you would spot that you could play the game with an 8 hour increment, but that wouldnt work as I’d be in the pub by then regailing the locals with exotic stories, that I’d forget I was playing the game. Then I’d have to thrash myself with heather sticks for letting myself down. Armadale, Kirtomy and Swordly flashed by and soon I had arrived in Bettyhill, so called because of a local woman who lived here in the 1800s. Her name was Nora and she lived in the valley. 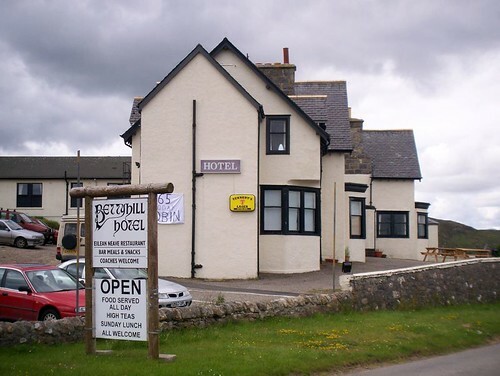 I popped into the Bettyhill hotel for a quick gwinss before bed. I must admit it had its share of characters. Nothing unusual – 3 or 4 completely inebriated Glaswegians and the usual Czech barmaid behind the bar. My theory about drunken Glaswegians in far away places is that they are just big scared laddies, who panic when they have to leave their “dear Green Place” and the alcohol makes it easier to integrate. Maybe Im wrong – opinions to the contrary always welcome. This entry was posted on Friday, May 25th, 2007 at 11:16 pm and is filed under Scotland. You can follow any responses to this entry through the RSS 2.0 feed. You can leave a response, or trackback from your own site.